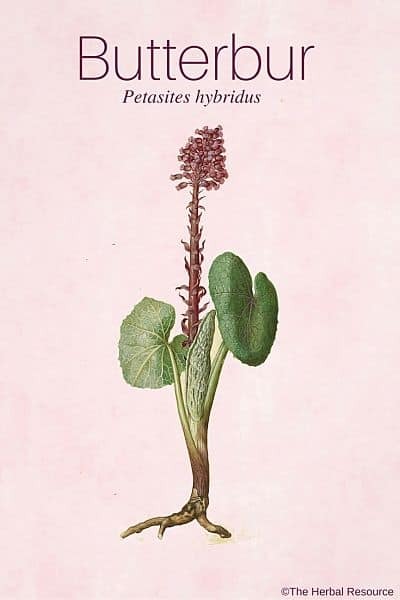 Other Common Names: Common butterbur, sweet coltsfoot, blatterdock, bogshorns, butter-dock, butterly dock, capdockin, flapperdock, and langwort. 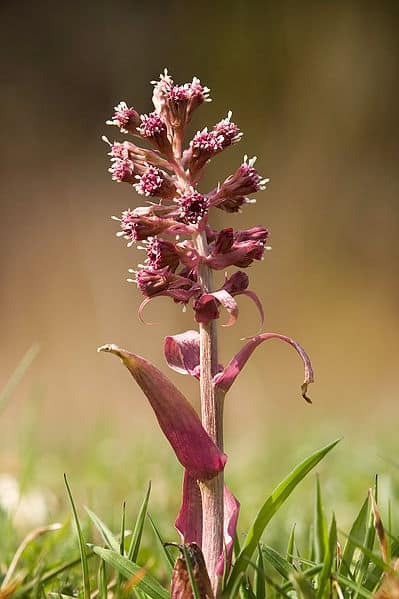 Habitat: Butterbur is native to mainland Europe, as far north as Scandinavia. It also grows in Western Asia and has been successfully introduced to Northern America. It typically will grow in shady places or beside waterways. It also grows well in wet meadows, copses, marshes, flood plains, washes, and damp roadsides. Description: Butterbur plant has huge leaves resembling the leaves of the rhubarb. The leaves, which grow big enough to protect a person’s head from the sun or the rain, caused the Greeks to name it the hatplant. The flowers grow before the leaves usually in February. The pink flower stalks push their way through the earth looking similar to the mushroom. When fully extended, the flower spikes are purple at the base, with pale reddish-lilac flowers. Plant Parts Used: The leaves, flowers, stems and roots. The root and the leaves operate in all the following capacities: analgesic, anti-spasmodic, anti-inflammatory, cardiotonic, diaphoretic and diuretic. Historically, the dried powdered root was mixed with wine and used as a medicine against the plague and other related diseases. In its powdered form, it was also used to eliminate intestinal worms, as a diuretic and to stimulate menstruation. Externally, the powder was dusted on ulcerating sores. 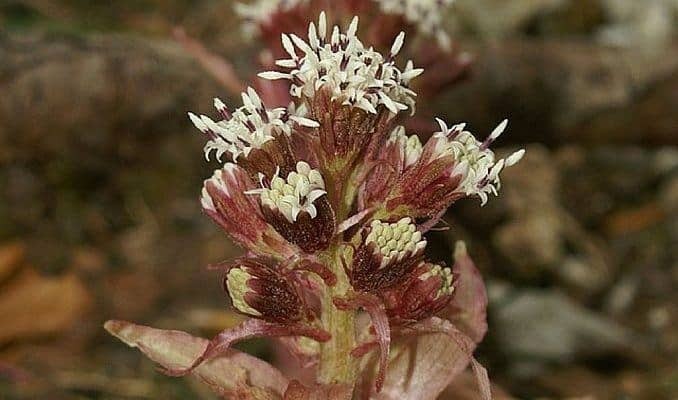 More recently, because butterbur has tonic and expectorant, anti-inflammatory and antispasmodic properties, it has been used in the treatment of a number of chests and bronchial related illnesses. 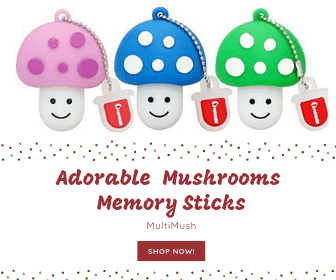 It is used for the herbal treatment of coughs, such as general coughs, laryngitis, pharyngitis, bronchitis, asthma, hay fever and whooping-cough. A 1998 Polish clinical study was conducted specifically to determine its influence on lung ventilation and bronchial reactivity in asthma and chronic obstructive bronchitis patients. The study showed the herb could be helpful in improving lung ventilation in asthmatic or chronic obstructive bronchitis. Its antispasmodic properties are also effective in the treatment of gastrointestinal conditions because butterbur helps to strengthen digestion. It is especially useful where indigestion results from obstructed bile flow. It acts specifically on the stomach, bile ducts, and duodenum. It has been used somewhat successfully in the natural treatment of colic. It has also been used as a remedy for inflammation of the urinary tract and including the treatment of kidney gravel. Its analgesic properties make it a strong choice for the relief and prevention of headache pain. In recent studies that have been conducted a strong case has been built on its anti-inflammatory and vasodilatory actions. The largest study that was conducted involved 245 people who had suffered migraines. The group which took 75 milligrams twice a day for four months showed that with regular intake it could be useful herb for migraine headaches. Some herbalists have used it as a poultice, made from the fresh leaves or of the leaves and flowers for external application of skin eruptions or on wounds. Put 1 teaspoonful of the root in a cup of water and bring to the boil. Simmer for 10-15 minutes. Drink the tea three times a day. Take 1- 2 ml of the tincture three times a day. Possible side effects of butterbur are indigestion, headache, nausea, vomiting, diarrhea, or constipation. It is not recommended for children, pregnant or nursing women and people with kidney and liver disease. Butterbur is in the ragweed plant family, so people who are allergic to ragweed, marigold, daisy, or chrysanthemum should avoid it. Butterbur contains pyrrolizidine alkaloids which may be liver-toxic and carcinogenic. It is possible to remove these compounds from butterbur products. In Germany, the maximum allowable content of pyrrolizidine alkaloids in butterbur supplements has been set at 1 microgram per daily recommended dose.